This location is a great and now easily accessible hill forest to montane forest site in East Java, with good forest along a c8km section of metalled road from 1000m-1800m elevation, and then a popular tourist track to Ijen’s blue lake crater (c2340m) and summit (c2770m). At the time of writing species such as White-bellied Fantail, Dark-backed Imperial Pigeon & Pink-headed Fruit Dove are still relatively widespread along the main road, and two species with very localised distributions, White-faced (Grey-breasted) Partridge and Sunda Grasshopper (Javan Bush) Warbler are both relatively abundant (although not necessarily easy to actually see well!). For those visitors wanting to have a reasonable chance of seeing the majority of montane endemics Java has to offer, this site is an excellent addition to the two main western sites of Gunung Gede and Gunung Halimun. All of the species can be seen along the main road, from the edge of the forest at 1000m to Paltuding at 1800m, where there are a number of cafes, park buildings, a campsite, and the start of the mountain trail to the blue lake crater. The road up has been recently sealed, and is fully accessible (to Paltuding) in a two wheel drive car or motorbike/scooter, although it is quite steep in places. There are four rest stops/shelters on the way up and these can serve as markers for sightings. The road has some traffic, which can be distracting when bird watching along it, but it is certainly not a busy road for traffic. The lower section of the road up from the first shelter at the edge of the forest to the second and third shelter provides most opportunity to see lower elevation hill forest species, such as the barbets, woodpeckers and babblers, Orange-breasted Trogon, Javan Banded Pitta and Javan Owlet & Frogmouth. Above the third and fourth shelter, montane species become more frequent, with Dark-backed Imperial Pigeon and Pink-headed Fruit Dove both still pleasingly relatively frequent in 2016 at least. A couple of the most sort after species, White-faced Partridge and White-bellied Fantail are relatively widespread and can be found at all altitudes within the forest. Javan Hawk Eagle is also regularly encountered, suggesting at least one territory is present along the road. Good views of this species have been had around the forest either side of the fourth shelter along the road. Also pleasing to see is a healthy population of Wreathed Hornbill, which can be seen and heard anywhere within the forest along the road. Higher up two further species are regularly reported. The first, Sunda Grasshopper Warbler, appears to be present in any open scrub on the edge of the forest, and around the cafes at Paltuding and the pass at the top of the road. Try the open fern dominated section on the west side of the road from the edge of the forest to the Paltuding turn off. Sunda Bush Warbler is also common here. The second species, Horsfield’s Thrush can be found along the main trail from the cafe area (Paltuding) to the blue lake – although this is a popular tourist destination, with disturbance often pre-dawn and at dawn, as people travel and walk the track to see the sun rise over the lake. The Thrush can be seen in other less disturbed habitat around the pass. Try for example any areas under the tree belts and more open woodland around the edge of the campsite. It may also be seen from the main road in the forest at lower altitudes. With the site now being birded more frequently thanks largely to the easier access, maybe other Javan specialties will turn up. 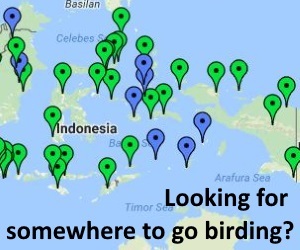 Javan (White-breasted) Babbler has recently been claimed, and maybe further nocturnal forays will discover a modern location for the poorly known eastern populations of Javan Scops Owl? Outside of the forest and towards the coast at Banyuwangi, areas of rice paddies and cultivation are good for open country species, including Javan Kingfisher – try the paddies south of the city and towards the airport for this species. Who knows, other rarities such as Java Sparrow may also be just about surviving in the countryside around here. The site is accessible from Banyuwangi to the east (the usual starting point), or Bondowoso from the west. There appear to be no public transport options, so access should be via hire vehicle (car or motorbike/scooter). From the centre of Banyuwangi the road to the first shelter at the start of the forest is about 23km and is signposted and relatively straightforward to find. Many accommodation options are available in Banyuwangi, with a few homestays and lodges now also present much closer along the access road around the small village of Licin. A campsite is also present at Paltuding. Scooter and motorbike hire is available in Banyuwangi at least, and may be possible from your accommodation too. Banyuwangi is served by a small airport south of the city (limited internal flights are possible eg to Surabaya), a port with regular 24 hour ferry service to Gilimanuk in Bali, and a train station with cross country trains to cities to the west. Access to the forest along the road to Paltuding is free and the forest is not yet within the protection of a National Park. To access the blue lake/summit trail a permit/fee is mandatory, and possibly also a local guide/tour operator if you intend to go all the way to the crater, where gas emissions and ground conditions can be dangerous and require use of breathing equipment (gas masks). The trail is 3km+ and can take 1-3 hours. Local guides hang around Paltulding touting for business. Tour operators are present in Banyuwangi, for people whose main aim is to visit the lake at sunrise and see the ‘blue fire’ created by the gasses within the lake. These tours are however not geared for bird watching and unlikely to be very suitable. The birding is in fact best along the main road, negating the need to visit the blue lake trail if you don’t have a strong desire to see the crater/summit area. Hi do you know of a good bird guide for Ljin? He has a hide set up in a jungle camp which works well for Lesser Shortwing, Crescent-chested Babbler, several Flycatchers, Javan-whistling Thrush and crucially White-faced Partridge and Horsflied’s Thrush amongst others. Wonderful for photography. 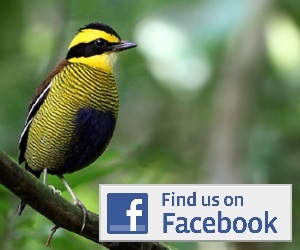 Heri Bambudi, how can I contact you for bird guiding?